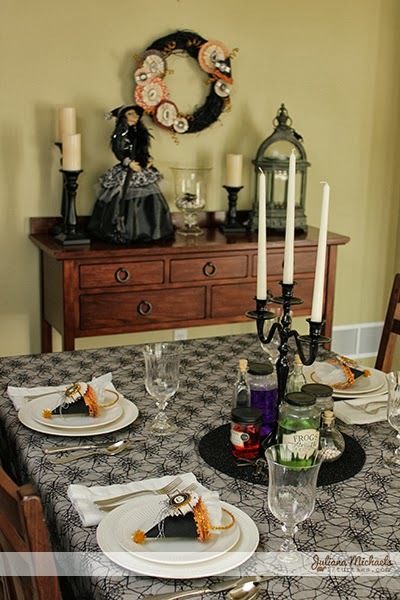 As I have already mentioned, I love Halloween and now that we are finally settled into our new home, I have really gotten into decorating for our upcoming Halloween party. 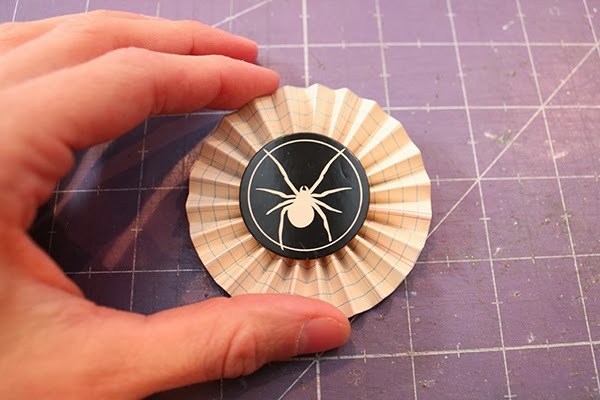 Thanks to American Crafts, who sent me a box of some of their new exclusive Target Halloween collection, I was able to add to my Halloween decorations with some homemade crafty projects. I immediately fell in love with the new collection and started crafting. In the end, I ended up with three projects that I want to share with you. 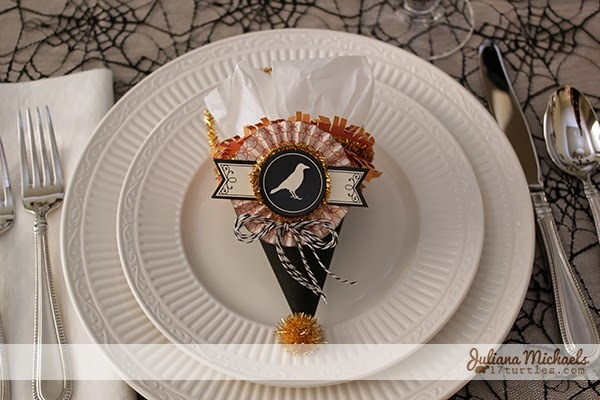 Today I am sharing my first of these three projects, which is a set of Halloween Treat Cones using their Halloween Witch Hat Placecards Kit. 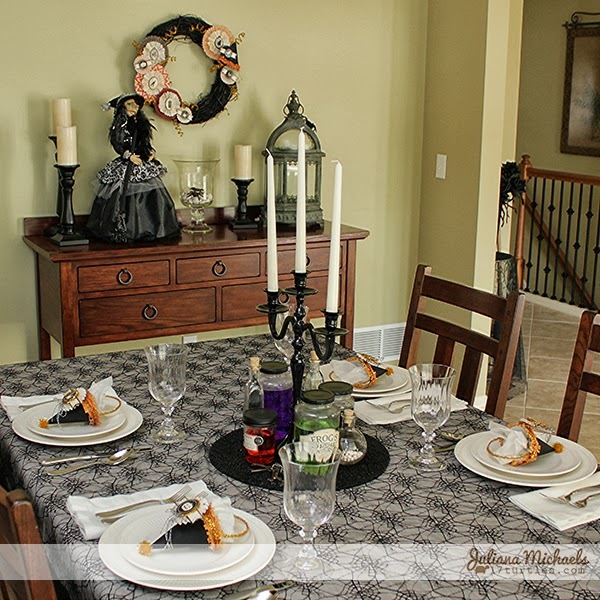 The idea behind this entire collection is to keep the decorating easy and simple. That is all well and good, but I always like to add my own touch to things. So, I couldn't resist doing just that with this kit. I think that I still kept it simple, but I definitely mixed it up a little bit when it came to using the kit. 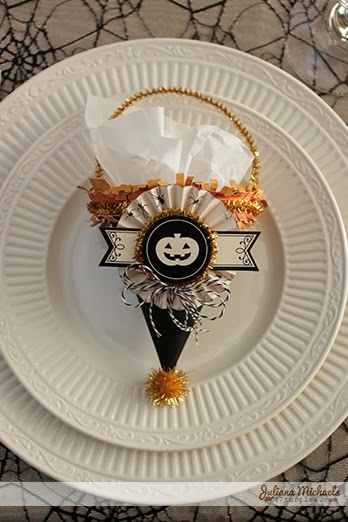 Take a peek at what I created and then keep reading for a tutorial you can follow to create your own Halloween Treat Cones. Assemble the cones as instructed. 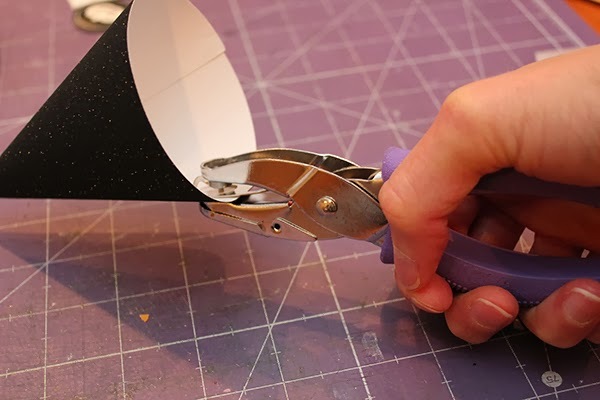 Use a hole punch to punch a hole on opposite sides of the cones. 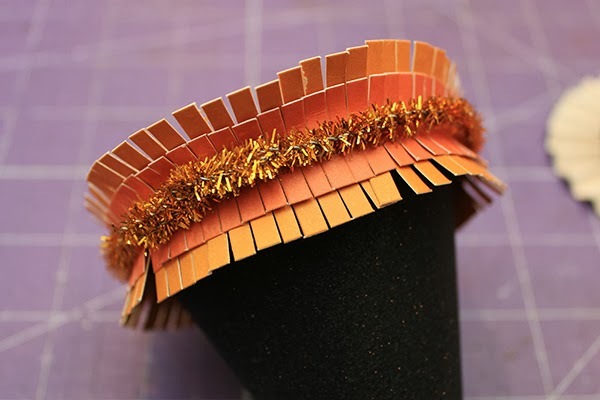 Add the fringed trim per the instructions that come with the kit and set it to the side. 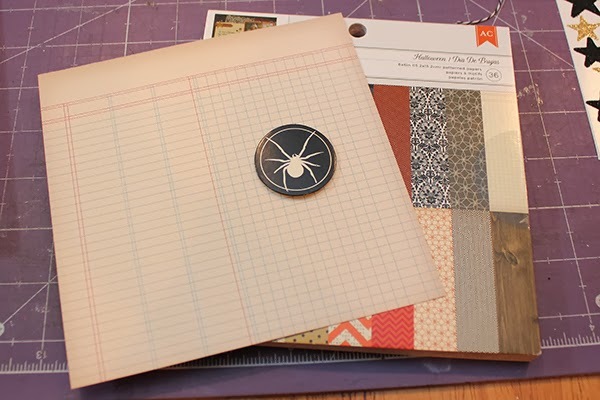 Select a piece of patterned paper from the 6x6 paper pad. 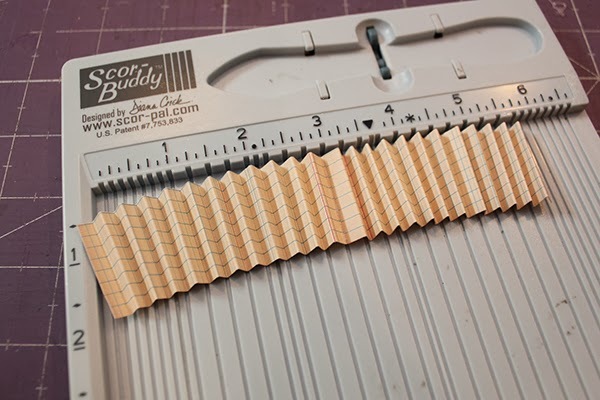 Cut 2 strips to 1.25". 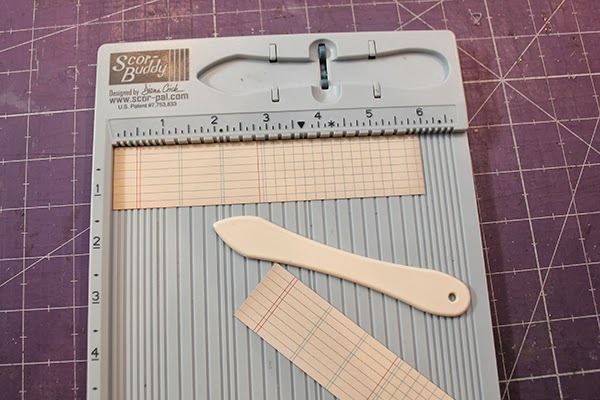 Score them at 0.25" increments with a scoring tool such as the Scor-Buddy. 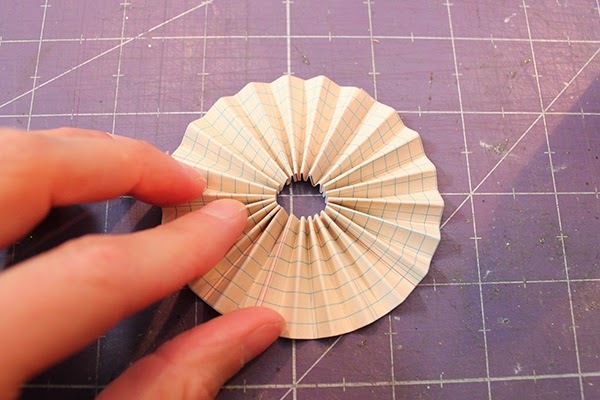 Accordion fold both pieces of paper. Glue the pieces end to end. Then glue them to create a circle. Lay the circle flat. Squish the center together from the outside and place the sticker on top. 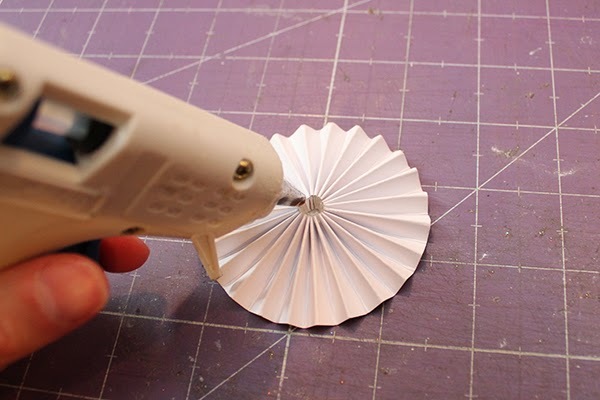 Flip the rosette over and apply a dab of hot glue to the center and hold the center together until the glue is dry. 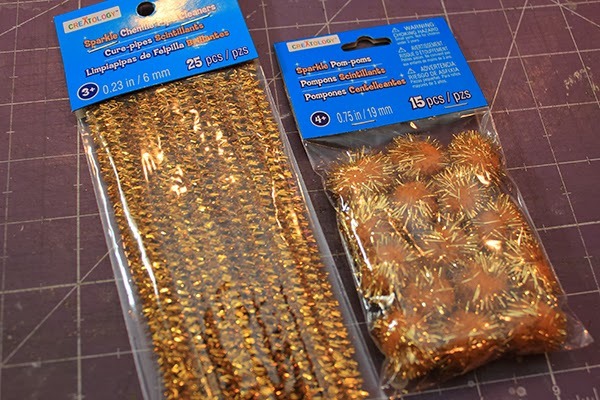 Now you will need a couple of supplies from your local craft store: gold pom poms and gold chenille pipe cleaners! 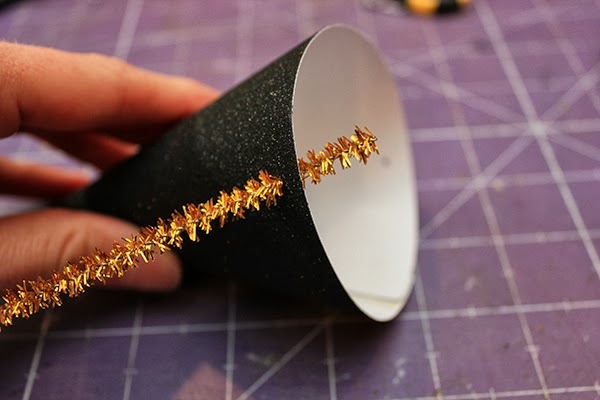 Take one of the gold pipe cleaners and trim off 3 inches. 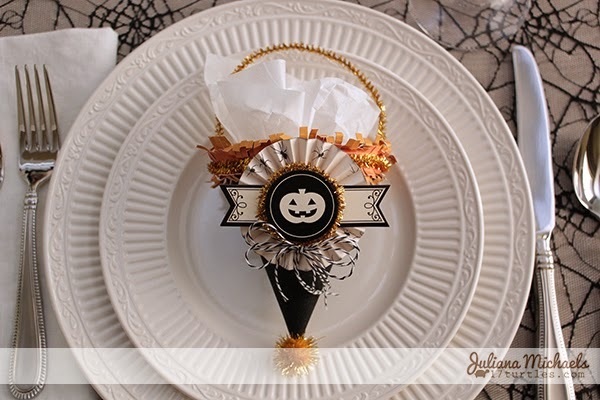 Save this to tie around your treat bags that you place inside the cones. Stick one end of the pipe cleaner through the poked holes and bend it to hold it in place. Then take the other end and stick it in the other hole to create a handle. Next, take 2 pipe cleaners, twist them together and then wrap them around the hat. 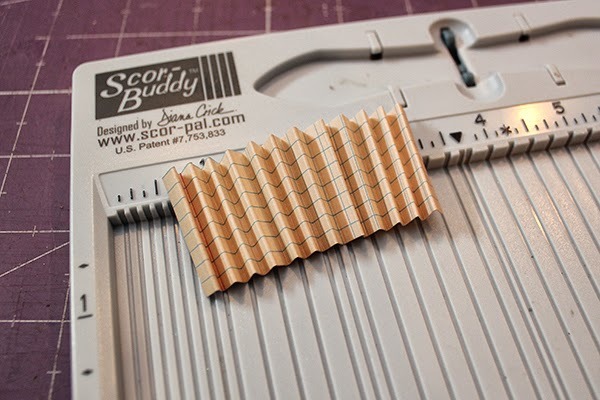 Twist the overlapping ends together and bend them to lay flat. Cut a 5" length of the pipe clean, bend it into a circle and glue it around the circle sticker. 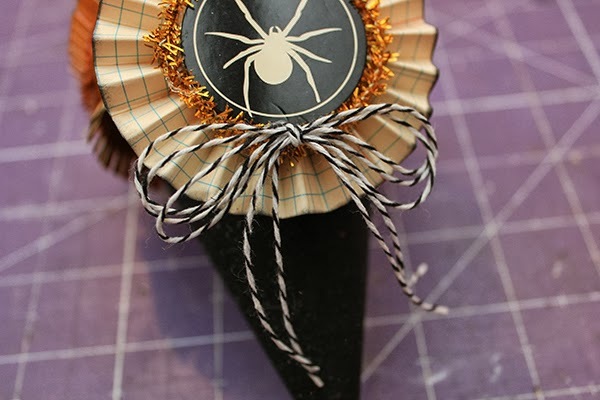 Adhere rosette to your cone covering up the overlapped pipe cleaners. 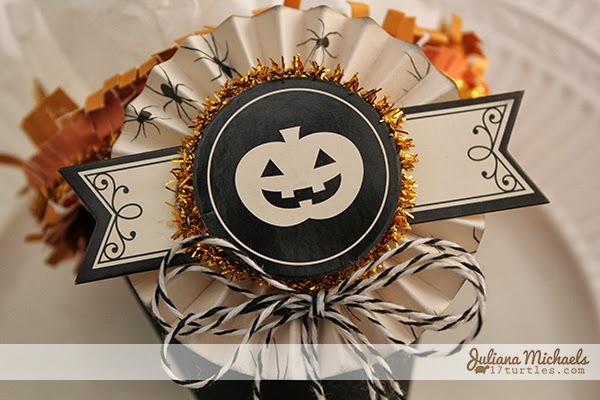 Create a bow using the black and white baker's twine and hot glue below the sticker. 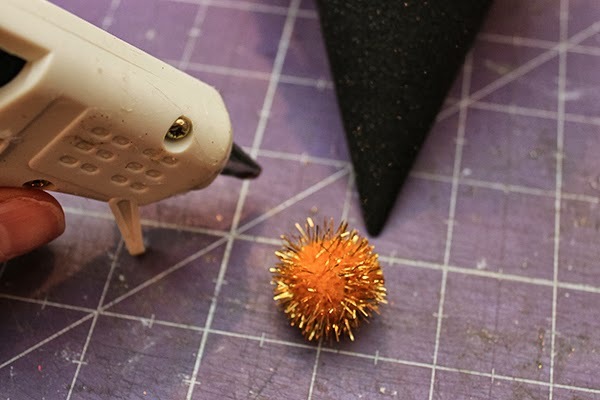 Finally, hot glue one of the gold pom poms to the base of the cone. In the background here you have a little peek of the projects I will be sharing with you the next 2 days. 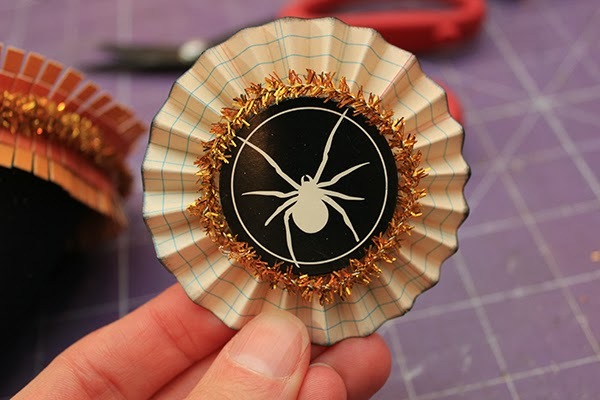 Tomorrow I will be sharing a Halloween Rosette Wreath that I created with the American Crafts exclusive Target Halloween collection. 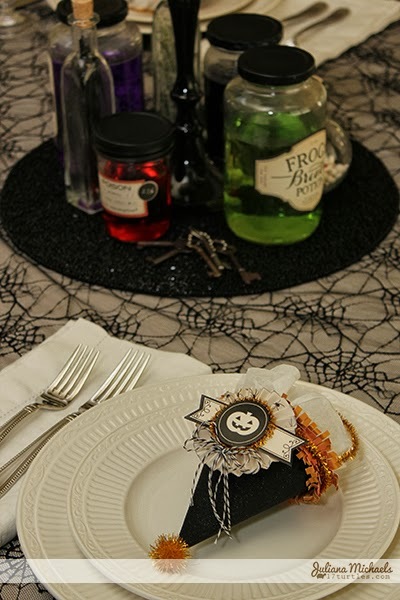 The next day I will be sharing how I created a group of fun Halloween Labeled Jars. 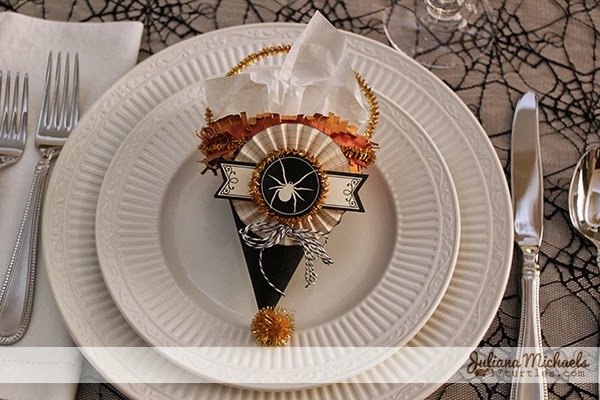 I hope you enjoyed my Halloween Treat Cones and don't forget to check back the next 2 days for more Halloween projects! Wowzer! Absolutely amazing Juliana! You are queen at jazzing things up! Can't wait to see the rest! Lovely tutorial! Loved seeing your steps. Such an awesome idea Juliana!! 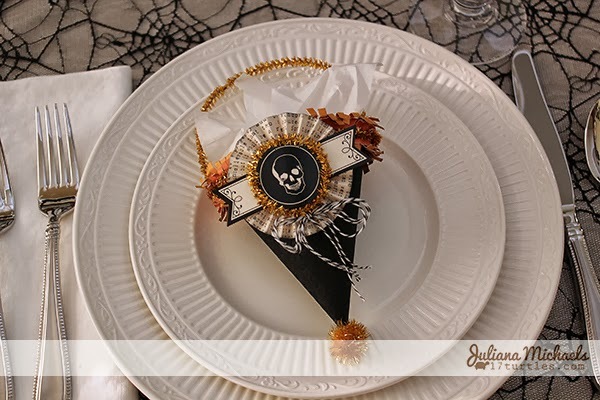 Love how these look on your table setting! Great job with the AC Halloween line! Wowwwwwwwwwww!! These are awesome!! So cool!!! You make me wish we celebrated Halloween here in Australia. What fabulous projects. Love these so much and thanks for the tutorial! I have to have one of these! They look great! I am beyond in love with these! Wow!